Gyproc Block H Level 1 is Away Fans Stand. Kindly refrain from carrying any Bags, Helmets, Cameras, Bottles, Laptops, Firecrackers, Lighters, Weapons, Tins/Cans, Water Balloons, Umbrellas, Tobacco Products, Fireworks, Outside Food/Alcohol, Metal Containers, Musical Instruments of any kind as they are strictly prohibited inside the stadium due to security reason. ISL season 5 is back with some great excitement and even greater matches. Get ready to catch the action live between Chennaiyin FC and Jamshedpur FC. So are you excited to witness Chennaiyin FC take on the challenge and battle it out against Jamshedpur FC for the championship? This match is going to be an exciting experience for all you football lovers so better now miss it. The entry ticket ("Ticket") entitles the holder ("Holder") to attend the stadium ("Stadium") in respect of the match ("Match"), details of which are referred to on the Ticket. Entry to the Stadium is subject to acceptance by the Holder of the "Terms and Conditions", which include: these terms, those terms and conditions stated on the Ticket and any other Stadium–specific regulations which may be displayed at the Stadium, and all present and future laws, rules and regulations. Entry to the Stadium shall constitute acceptance by the Holder of all of the Terms and Conditions. This Ticket is valid for one person only and no re-entry will be allowed unless explicitly stated on the Ticket. 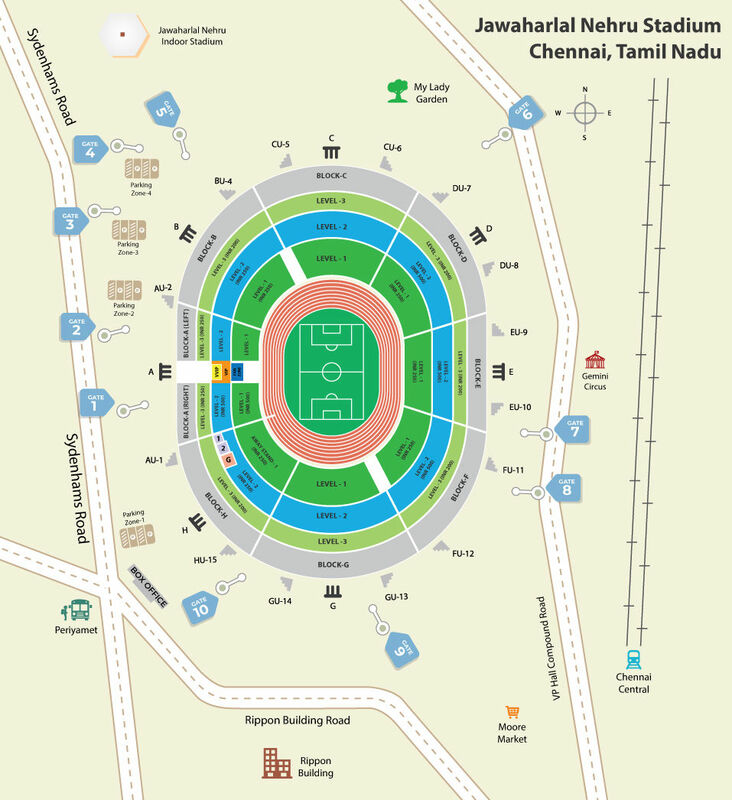 This Ticket only entitles the Holder to access the area of the Stadium in which the relevant seat is located and no other area of the Stadium. The Holder must retain this Ticket at all times whilst in the Stadium and produce the same whenever demanded by Football Sports Development Private Limited ("FSDPL"), the Stadium owner, and/or any of their representatives or the home club (individually or together, the "Organiser") and the Organiser’s representatives, including without limitation, law and order authorities and private security personnel (the "Security Personnel"). The Organiser reserves the right to search / frisk the Holder (including his/her bags, clothes or other possessions) through Security Personnel or any other representatives at any time. No item, including without limitation clothing, caps, banners or flags etc, displaying commercial logos, which, in the Organiser’s view, conflicts with or in any way detracts from the rights of any official sponsor related to the Match, and/or any such items which, in the Organiser’s view, constitute "ambush marketing", will be allowed into the Stadium. Bags (except ladies’ hand bags but including back packs, laptop bags, suitcases), laptops, helmets, bottles, lighters, tins or cans, musical instruments, water balloons, eggs, flammable, toxic, illegal or hazardous substances, tobacco or tobacco products, metal containers, firecrackers, fireworks, weapons (including Swiss army knives and similar instruments), motorcycle helmets, bags, animals (except guide dogs) or any other article which might endanger or unduly annoy any other person are not allowed inside the Stadium. No provision is made for the storage of these items and each of these items will be confiscated at security check points and will not be returned. No outside food and/or alcohol may be brought into the Stadium. No smoking is allowed within the Stadium. This Ticket is strictly not transferable and is for the personal use of the Holder only. It shall not be offered for sale, auctioned, exchanged, ceded, sold or transferred, whether in a commercial or promotional context (such as, without limitation, a prize in a lottery or competition or as part of an advertising or promotional campaign) or otherwise, with or without consideration, unless written permission is obtained from the Organiser. The use of any equipment of any kind including without limitation mobile phones, transistors, computers, cameras or any other audio visual recording equipment, for recording and/or communication of Match details, statistics, images etc is strictly prohibited. The Holder acknowledges and consents to the recording of his/her likeness and/or voice and further acknowledges and agrees that FSDPL is entitled to use and sub-license all rights in respect of such recordings without compensation of any kind to the Holder. The Holder will not sell or offer for sale any product or service from any part of the Stadium and may not distribute or give away any free item(s) or any political, religious, charitable, commercial, advertising or promotional material(s) from or at any part of the Stadium. Foul, abusive or any discriminatory language (whether on the grounds of race, religion or otherwise), unruly language, unruly or threatening behavior, entry onto the field of play or the throwing or projecting of any article within the stands, on the field of play or otherwise in the Stadium will not be tolerated at the Stadium prior to, during or after the Match. The Organiser does not guarantee that the Holder will have an uninterrupted and/or uninhibited view of the Match from the seat provided nor does FSDPL and/or the Organiser give any warranty as to the quality, content or duration of the Match. Refunds (less any applicable administration fee), if any, will only be made if the entire Match is cancelled without a Match commencing. No other refunds will be made. The Ticket must be produced whenever demanded by FSDPL, the All Indian Football Federation ("AIFF") and/or the Organiser, or each of their representatives. The Holder must comply with any reasonable instruction from any official at the Stadium. Any property left anywhere at the Stadium remains at the entire risk of the owner of the property or person leaving the same, the Organiser does not accept any liability for the theft or other loss or damage of such property. Though reasonable efforts have been taken to ensure the safety and comfort of the spectators during the Match, the Organiser disclaims any responsibility for death, injury, and/or any loss or damage whatsoever, caused to the property or person of the Holder. Children of three years of age or over must have their own ticket and all persons under the age of 18 must be accompanied by and under the supervision of (in each case constantly) an adult who also has a Ticket for the Match. Responsibility for minors remains at all times with the minor’s parent or guardian. The Ticket will be valid until the relevant Match has been completed or is reasonably deemed by the Organiser, FSDPL and/or the AIFF to have been completed. The Ticket may not be exchanged or used for any match or event other than that indicated thereon. If the Match is cancelled or curtailed for any reason, there shall be no obligation on the Organiser, FSDPL and/or AIFF to reschedule the Match. The Organiser, FSDPL and/or AIFF reserves the right to make alterations to the times, dates and venues of the Match or to substitute the seat or area to which the Ticket refers at its reasonable discretion. Neither FSDPL, the AIFF nor the Organiser will be liable to the Holder whether in contract, tort or otherwise for any indirect, incidental, special or consequential loss or damage or for any loss of profit or revenue, loss of use, loss of business or contracts or loss of opportunity arising out of or in connection with the Match howsoever caused. Neither FSDPL, AIFF, the Organiser nor any other person associated with them shall, to the fullest extent allowable by law, be liable to the Holder for death, any injury or any other loss of any kind suffered by the Holder within the Stadium including without limitation as a result of the Holder being hit by a ball or any other object which has been projected from the field of play, whether the same occurs before, during, after or otherwise in relation to the Match (including without limitation by any person unconnected with the Match at any time whilst the Holder is in the Stadium) and the Holder hereby waives all rights to bring any claim of any kind against FSDPL, AIFF, the Organiser or any third party in relation to any of the foregoing. If the there is any conflict between these terms and the terms stated on the Ticket, these terms shall take precedence. If any provision of the Terms and Conditions shall be void or unenforceable by reason of any applicable law, it shall be deleted and the remaining provisions hereof shall continue in full force and effect and, if necessary, be so amended as shall be necessary to give effect to the spirit of these Terms and Conditions so far as possible.